Here is a selection of the best hotels in Long Beach, California, that are great for all travelers from couples to cruise line passengers to families. One of the best properties for families who are looking for all-suite accommodations and value is the Residence Inn by Marriott Downtown Long Beach. For couples looking for a romantic twist on lodging within a unique historical setting then the Queen Mary is perfect. Trendy travelers will be pleased with the Hotel Current or the Varden-a Boutique Hotel. Families that are searching for mid-range accommodations should try the Hilton Long Beach Hotel, the Best Western Plus Hotel at the Convention Center or the Holiday Inn Long Beach –Downtown. Travelers that are budget oriented will be thrilled with the Super 8 Long Beach or the Best Western of Long Beach and the Courtyard by Marriott Long Beach Downtown adds value with a private balcony. The Residence Inn by Marriott Downtown is an ideal all-suite hotel in Long Beach for all types of travelers who are looking to be close to many local attractions. Located within a mile of downtown and the Long Beach Convention and Entertainment Center, the Residence Inn by Marriott Downtown Long Beach is situated along the Queensway Bay and is within walking distance to Shoreline Village as well as Aquarium of the Pacific. The Residence Inn by Marriott Downtown Long Beach has a modern eleven floor architectural style with 178 suites which boast a contemporary decor. Studios have 540 square feet with an open floorplan that consists of a sleeping/living/dining area with a full kitchen and offers a view of the city or Queensway Bay from floor to ceiling windows. One-bedroom suites range in size from 546 to 676 square feet with a separate living room that contains a sofa sleeper as well as an integrated kitchen area and views of the city or bay from floor to ceiling windows. Two-bedroom suites have 806 square feet with a separate living room that is furnished with a sofa sleeper, 2-bathrooms, full kitchen and a view of the city or Queensway Bay. The Residence Inn by Marriott Downtown hotel in Long Beach is a superb place to begin your explorations of the surrounding area with numerous attractions within walking distance such as the Queen Mary, Pine Avenue for shopping and the Pike at Rainbow Harbor. I you are seeking watersport activities try the Shoreline Aquatic Park and you are within 2-miles to City Beach. The Residence Inn by Marriott Downtown hotel in Long Beach has a freshwater swimming pool with a sundeck and fitness center onsite. Dining at the hotel includes a complimentary breakfast and you can cook a leisurely meal in your suite. Offsite dining choices within walking distance include the Reef Restaurant for seafood, Gladstone’s Long Beach and Famous Dave’s has barbeque. Nightlife includes a manager’s mix with cocktails as well as appetizers Monday through Thursday and there are several venues nearby such as the Laugh Factory or Sgt. Pepper’s Dueling Piano Cafe. 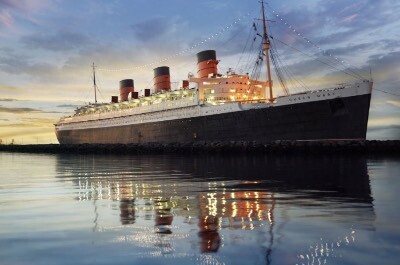 When you are interested in staying in a historic hotel in Long Beach that offers a thrilling story and unique accommodations then try the Queen Mary. Located south of downtown Long Beach in the Queensway Bay, the Queen Mary was constructed in the 1930s as the ultimate luxury cruise liner and was listed on the Register of Historic Places since 1993. The Queen Mary has been docked in Long Beach since 1967 and offers 346 staterooms and suites over three decks which each unit boasts a unique Art Deco interior. Staterooms are available inside the interior of the ship as well as with operable portholes. Deluxe staterooms feature more space with a sitting area as well as operable potholes. Two-bedroom Family staterooms have adequate space for families with a sitting area and operable portholes. One-bedroom Mini-suites are furnished with a separate living room that includes a sofa and 2-bathrooms along with operable portholes. One-bedroom Full suites have a full living room, breakfast nook, 2-bathrooms and operable portholes. The Queen Mary is within 1-mile to many of the area’s major attractions such as the Shoreline Aquatic Park, the Aquarium of the Pacific and Shoreline Village for shopping. The floating hotel in Long Beach has numerous attractions onsite that include a museum dedicated to Princess Diana, haunted ghosts tours are offered and the entire cruise liner has been turned into several mini museums that explain the ships glory days. The Queen Mary is packed with other onsite amenities which include a gorgeous sundeck, shopping boutiques, a 4D Theater and a full service spa. Dining onboard the Queen Mary is plentiful with Chelsea Chowder House serving all three meals and the Midship Makertplace serves quick bites. Sunday brunch is a treat onboard and you can indulge in an elegant dinner at Sir Winston’s Restaurant and Lounge. Offsite dining choices within walking distance include Parker’s Lighthouse, the Yard House and Tequila’s Jack prepares Mexican dishes. Nightlife includes the Observation and Art Deco Lounge where you will find DJ’s on the weekend and a relaxed atmosphere during the week. When you are seeking an upper-mid-range hotel in Long Beach which is ideal for families and boasts great access to numerous attractions in the area then you should try the Hilton Long Beach Hotel. 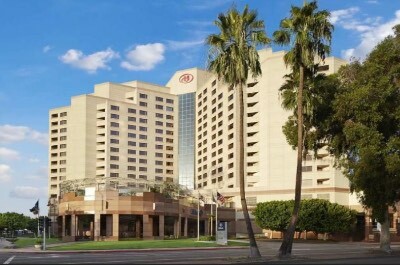 Located 0.5-miles west of downtown Long Beach adjacent to the World Trade Center, the Hilton Long Beach Hotel is situated within 1-mile to the Long Beach Convention and Entertainment Center as well as the Queen Mary. The Hilton Long Beach Hotel has a modern nine story architectural design with 399 rooms and suites which feature a contemporary interior. Rooms are sized at 300 square feet with a choice of bedding, floor to ceiling windows and corner rooms are available with balconies that sport a view of the city skyline or the Los Angeles River. Executive style rooms are similar in size with upgraded amenities such as a free complimentary breakfast. One-bedroom junior suites are 650 square feet with a sofa sleeper in a separate living room and a balcony with city views. The Hilton Long Beach Hotel is a perfect place to begin your adventures of the area with several major attractions within a short walk that include the Aquarium of the Pacific, the Pike at Rainbow Harbor and shopping at Pine Avenue. If you are seeking a beach area then try City Beach where you will find watersport activities as well as plenty of space to lounge. The Hilton hotel in Long Beach has a freshwater swimming pool with a nice sundeck and a fitness center onsite. Dining at the hotel includes the Loft for breakfast and the Enclave Lobby Bar and Kitchen serves lunch as well as dinner. There are also quick bites available or breakfast and lunch at the Cafe. Dining options offsite are plentiful within walking distance with George’s Greek Café, Pier 76 Fish Grill and L’Opera Ristorante serves Italian. Nightlife within walking distance is plentiful with drinks at The Wine Barlb as well as the Stave or you can try the Dinner Detective Murder Mystery Dinner Show. 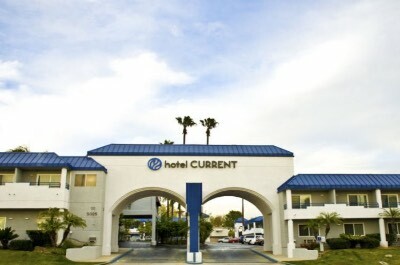 The Hotel Current is a mid-range hotel in Long Beach that offers comfortable accommodations for families and cruise line passengers who are looking to be close to several attractions in the area. Located northeast of downtown Long Beach in the Circle Area neighborhood, the Hotel Current is situated within 4-miles to the Queen Mary as well as the Aquarium of the Pacific and offers a complimentary shuttle to the Cruise Port Terminal. The Hotel Current has a modern two floor architectural style with Spanish ascents that contains 99 rooms and suites that have a fresh trendy decor. Lifestyle rooms range in size from 250 to 300 square feet with a choice of bedding and some are available with spa tubs. One-bedroom Lifestyle apartments are spacious with a separate living room that includes a sofa. The Hotel Current is within walking distance to the Walter Pyramid, the Earl Burns Miller Japanese Garden and you are within a 2-mile drive to Naples Island as well as Mother’s Beach within the Marine Park where you will find plenty of watersport activities. The Hotel Current in Long Beach has a freshwater swimming pool with a nice sundeck and courtyard but does not offer a fitness center. Dining onsite includes a complimentary continental breakfast and you will find numerous options within a short distance which include the Crooked Duck for American dishes, Nick’s prepares steaks as well as Hof’s Hut. Nightlife can include a live performance at the Long Beach Playhouse and cold beverages at Blondie’s or Crow’s Cocktail of Naples. If you are looking for a mid-range value oriented hotel in Long Beach which is perfect for families and boasts easy access to major attractions then you should stay at the Best Western of Long Beach. 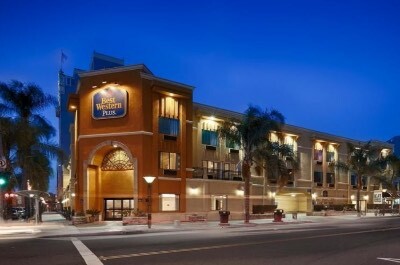 Located 2-miles north of downtown Long Beach in the Poly High neighborhood, the Best Western of Long Beach is situated within 2-miles to the Aquarium of the Pacific as well as shopping at Shoreline Village and there is a complimentary shuttle to the Long Beach Cruise Terminal. The Best Western of Long Beach sports a modern four story architectural design with 99 rooms and suites which boast a contemporary interior. Rooms are ample in size with a choice of bedding as well as small kitchenette which includes a microwave and refrigerator. Business level rooms are slightly larger with a sofa sleeper and a small kitchenette. One-bedroom suites have a separate living room and a small kitchenette. 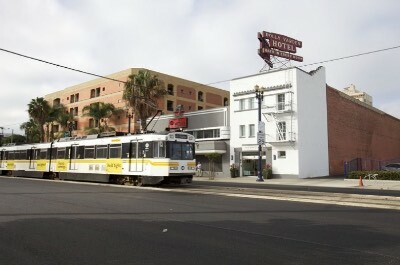 The Best Western hotel in Long Beach is ideal for your adventures with a Metro-Rail stop in front of the property. You have easy access to several major attractions that are within 3-miles of the hotel such as the Queen Mary, the Long Beach Convention and Entertainment Center as well as the Long Beach Museum of Art. There are plenty of watersport activities within 3-miles with City Beach, Alamitos Bay and the Shoreline Aquatic Park. The Best Western of Long Beach has a freshwater swimming pool with a sundeck and a fitness center onsite. Dining at the hotel includes a complimentary continental breakfast and you will find a plethora of offsite dining options within walking distance that include the Crazy Creole Cafe for Cajun, Taco Loco has Mexican dishes and King’s Fish House prepares seafood specialties. Nightlife nearby includes a short drive to the Stave for libations, the Laugh Factory has comedy and Joe Josts sport billiard tables. The Varden-a Boutique Hotel is an excellent mid-range hotel in Long Beach that is ideal for travelers who like trendy historic properties as well as being close to many nearby attractions. Located in downtown Long Beach, the Varden-a Boutique Hotel is situated within 0.5-miles from the Long Beach Convention and Entertainment Center and is less than 1-mile from the Aquarium of the Pacific. The Varden-a Boutique Hotel was constructed in 1929 with a 20th Century American Movement three floor architectural style that boasts 35 rooms which are furnished in a trendy chic decor. All rooms are 200 square feet with a choice of bedding and view of the surrounding city area. The Varden-a Boutique Hotel has a great position within the city for your explorations of the area to begin with numerous major attractions nearby. You will find within walking distance the Museum of Latin American Art and Pine Avenue for shopping as well as an easy 1.5-mile drive to the Queen Mary. Watersport activities can be found at Shoreline Aquatic Park and City Beach which are both within 2-miles of the property. The Varden-a Boutique hotel in Long Beach does not offer a freshwater swimming or a fitness center but you do receive a discount at a nearby Gold’s Gym. There is no restaurant onsite but you can indulge in a complimentary continental breakfast daily and you have numerous offsite dining options within walking distance that include LA Traviata for Italian, King’s Fish House prepares seafood specialties and Bo-beau Kitchen plus Roof Tap serves American cuisine. Nightlife includes a free wine and appetizer tasting every evening and offsite choices within walking distance can include Taco Beach Cantina and the Blind Donkey for cold beverages or you can try the Dinner Detective Murder Mystery Dinner Show. 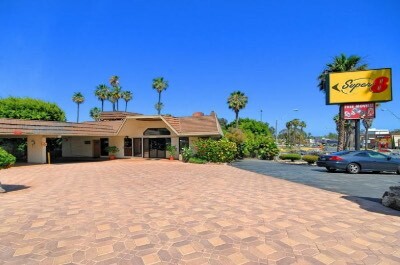 The Super 8 Long Beach is an ideal value oriented hotel in Long Beach for families and other travelers who like to be close to several attractions within the surrounding area. Located 3-miles northeast from downtown Long Beach in the Circle Area neighborhood, the Super 8 Long Beach is 4-miles to Seal Beach. 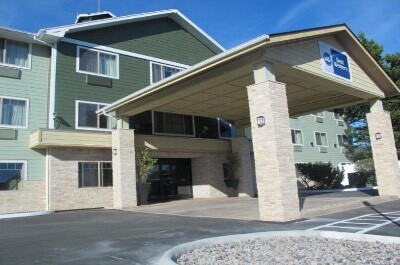 The Super 8 Long Beach has a modern two story architectural design with 49 rooms that boast a contemporary interior. Rooms are sized between 300 to 325 square feet with a choice of bedding and some rooms have a small kitchenette (microwave and refrigerator) as well as a private balcony that features views of the surrounding area. The Super 8 Long Beach is the perfect spot to begin your adventures with many attractions within 4-miles from the property such as Rancho Los Alamitos Historic Ranch and Gardens, the Queen Mary and the El Dorado Nature Center. Nearby City Beach is less than 2-miles away and offers a plethora of water activities as well as plenty of sand for relaxing. The Super 8 hotel in Long Beach has a freshwater swimming pool with a sundeck but there is not a fitness center or restaurant onsite. Dining at the Super 8 Long Beach consists of a free breakfast and you will find numerous restaurants within an easy walk such as the Market Place Grill Cafe, Big E Pizza and Los Compadres for Mexican cuisine. Nightlife within the surrounding area includes Iguana Kelley’s, Blondie’s as well as the North Star for an entertaining evening. If you are looking for a mid-range value oriented hotel in Long Beach that is ideal for families and boasts easy access to several major attractions in the area then you should stay at the Best Western Plus Hotel at the Convention Center. Located 2-blocks east of downtown Long Beach, the Best Western Plus Hotel at the Convention Center is situated within a 5-minute walk to the Long Beach Convention and Entertainment Center as well as 1-mile from the Queen Mary. The Best Western Plus Hotel at the Convention Center has a modern three floor architectural style with 66 rooms and suites that sport a contemporary decor. Standard rooms are 200 square feet with a choice of bedding and various views of the surrounding area (some rooms are available with a small balcony). One-bedroom King suites have 300 square feet with a separate living room that contains a sofa sleeper and views of the surrounding areas (some suites are available with a small balcony). The Best Western Plus Hotel at the Convention Center is a superb starting point for your adventures in the area with several major attractions within walking distance such as Pine Avenue for shopping, the Long Beach East Village Arts District and the Long Beach Museum of Art. There are several beaches located nearby such as City Beach and Alamitos Bay where you will find plenty of area on the sand to lounge and watersport activities. The Best Western Plus Hotel at the Convention Center has an indoor freshwater swimming pool and a fitness center. The Best Western Plus hotel in Long Beach at the Convention Center offers a complimentary breakfast daily but there is no onsite restaurant. Dining offsite within walking distance includes the Thai District, Modica’s Deli for Italian and George’s Greek Cafe prepares Mediterranean style cuisine. Nightlife within the surrounding area includes Harvelle’s Long Beach for libations, Sgt. Pepper’s Dueling Piano Cafe features live music and the Laugh Factory has comedy. The Courtyard by Marriott Long Beach Downtown is a perfect family friendly hotel in Long Beach that offers easy access to many of the exciting attractions within the area. Located just 2-blocks east of downtown Long Beach, the Courtyard by Marriott Long Beach Downtown is situated within a 10-minute walk to the Long Beach Convention and Entertainment as well as the Carnival Cruise Port. 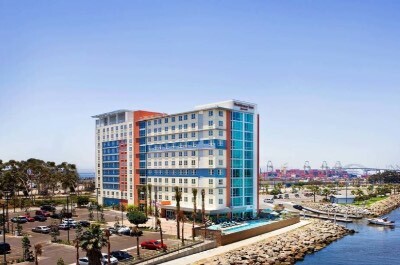 The Courtyard by Marriott Long Beach Downtown has a modern nine story architectural design with 216 rooms and suites that are furnished with a contemporary interior. All guest rooms and suites have a small balcony with views that vary from the surrounding city area to the Alamitos Bay where the Queen Mary resides. Rooms are sized at 300 square feet with a choice of bedding and some rooms are furnished with a sofa sleeper in an integrated living/sleeping area as well as varying views available. Oversized corner rooms have 350 square feet with an integrated sleeping/living area that contains a sofa sleeper and views of the Alamitos Bay as well as Queen Mary. The Courtyard by Marriott Long Beach Downtown is an ideal place to begin your explorations of the area with many attractions within walking distance or a short drive such as the Shoreline Village, the Aquarium of the Pacific and the Pacific Island Ethnic Art Museum. You also have easy access to the beach at Alamitos Bay where you will find plenty of watersport activities. The property contains a freshwater swimming pool with a sundeck and a fitness center. 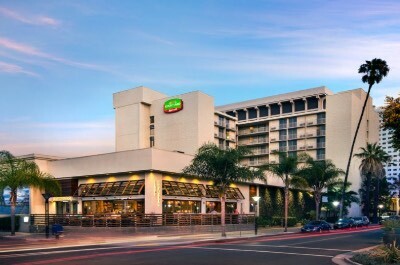 Dining at the Courtyard by Marriott hotel in Long Beach Downtown includes James Republic which prepares California influenced cuisine for breakfast and dinner as well as Sunday brunch. Dining within a short walk to the property includes the Long Beach Cafe for diner dishes, 555 East American Steakhouse and Super Mex. Nightlife in the surrounding area within an easy walking distance includes a cold libation at the House of Hayden, the Seabird Jazz Lounge for live music and the Terrace Theater for live performances. When you are seeking a hotel in Long Beach that is perfect for families as well as for all types of travelers and provides easy access to many of the local attractions then the Holiday Inn Long Beach-Downtown Area. Located just 1-mile north of downtown Long Beach, the Holiday Inn Long Beach-Downtown Area is situated less than a 20-minute walk to the Long Beach Convention and Entertainment Center. 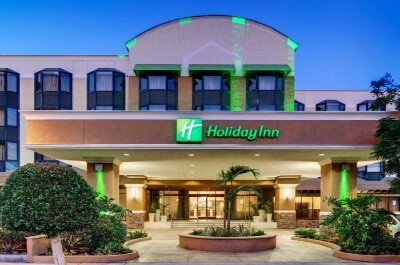 The Holiday Inn Long Beach-Downtown Area has a modern four floor architectural style with 134 rooms which feature a newly renovated contemporary decor. All rooms and suites are furnished with a small kitchenette (microwave and refrigerator). All rooms are spacious at 400 square feet with a choice of bedding and various views of the surrounding area. The Holiday Inn hotel in Long Beach -Downtown Area is a perfect place to start your adventure of the area and is a 5-minute drive from Alamitos Bay where you will find plenty of watersport activities and sand for relaxing. Other attractions within walking distance include the Museum of Latin American Art, Long Beach East Village Arts District and you are 1.5-miles from the Aquarium of the Pacific. If you are searching for a nearby beach area then try City Beach which is less than 3-miles from the property. An added bonus at the property is a complimentary shuttle bus within a 3-mile radius of the hotel. The Holiday Inn hotel in Long Beach -Downtown Area has a freshwater swimming pool with a sundeck and a fitness center onsite. Dining at the hotel includes the Connection Cafe which is open for breakfast and dinner. Offsite dining choices within walking distance include Beachwood BBQ and Brewing, Utopia for Italian and Crème De La Crepe prepares French specialties. Nightlife within walking distance of the hotel includes the Garage Theatre for live performances and you can indulge in a libation at the Stave or the Stache Bar.